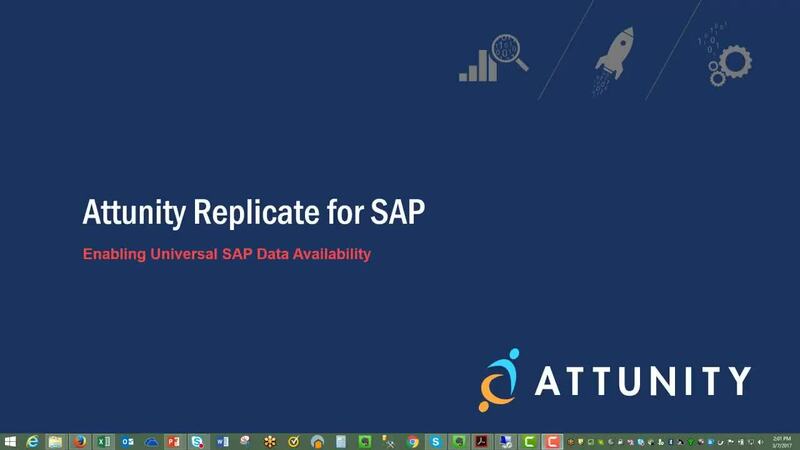 Attunity Replicate for SAP is a high-performance, automated, and easy-to-use data replication solution that is optimized to deliver SAP data and documents to any enterprise data warehouse, database, streaming or cloud platform – in real-time! Universal connectivity – leverage the industry’s broadest support for data sources and targets. Intuitive user interface – the web-based console is simple to configure, control and monitor enterprise replication tasks. High performance secure data transfer – Attunity Replicate compresses, encrypts and transfers data in parallel streams. Real-time change data capture (CDC) – Continuously updates targets to maximize throughput and minimize latency. In addition, source schema changes are automatically propagated. Agentless install and zero-downtime – Requires no additional software on the SAP source. In addition, log-based CDC protects the performance and integrity of production transactions. Start today and deliver SAP data to any platform whether cloud or on-premises — quickly, easily and in real time. Complete the form and an Attunity Representative will reach out to schedule a demo.